How do you show your school spirit? If you’re super proud of your alma mater and want to show off either your own accomplishments or those of other students, what’s your go-to solution? Students, parents, faculty, and administration all have a great and completely customizable option available to them with custom wall mounts. Here, we’ll take a look at just two of the many different scenarios where a custom wall mount is the winner when it comes to flashing school pride. If you, your son, daughter, or other family member has been mentioned in the local newspaper or even featured in a magazine for your/his/her athletic prowess, outstanding academic achievement, or other school-related headliner, you have something to be proud of. 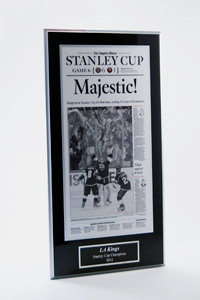 Freeze that moment in time by preserving it forever with a custom framed article mount for your wall. You’ll find that you not only have a piece of history beautifully preserved for all to see, you also have a statement piece that is completely customized to match the personality of the featured individual or one that matches the home’s interior – it’s your choice. As a school faculty, staff, or administrator, you want to instill pride in your students and other faculty while also showing visitors and outsiders those accolades that best demonstrate your sources of pride. When your students are featured in the local Sports section of the newspaper, an educator is featured in The New York Times Upfront, or your undergrads receive some time in the spotlight in a high profile publication like Forbes, these are moments that should be preserved for past, current and future students, staff, and the community to see. With a custom wall plaque from That’s Great News, you can create a Wall of Fame that is worth bragging about. Whether for your home or your school, a custom wall plaque from That’s Great News, your special article will be framed in a high quality preservation mount in your choice of color and style. See how good the source of your school pride will look with a FREE, no-obligation, online preview. Click below to get started.